In the dharmic religions (Hinduism, Buddhism and Jainism), the wheel of life (also called by a variety of other names; see the Names section below) is a mandala or symbolic representation of samsara, the continuous cycle of birth, life, death. One is liberated from this endless cycle of rebirth when bodhi, enlightenment, nirvana, moksha, or samadhi is reached. There are two primary forms of the wheel of life. The more elaborate form is usually six-spoked, though it is sometimes five-spoked. The simpler form, primarily used in Buddhism, is eight-spoked. In computer software Unicode, the wheel of life is called the «wheel of dharma» and found in the eight-spoked form. It is represented as U+2638 (☸). The symbol is also known as chakra from the Sanskrit word for wheel (not to be confused with the Hindu use of the same word to refer to energy nodes in the body— cf. chakra). The wheel of life is specifically known as bhavachakra or dharmachakra (the wheel of dharma). The more elaborate form of the wheel of life has six spokes (or sometimes five, as described in more detail below) and is used in all the dharmic religions. The wheel of life is represented as being held by the jaws, hands, and feet of a fearsome figure who turns the wheel. The exact identity of the figure varies. A common choice for the figure is Yama, the god of death. There is always a figure or symbol in the upper left and the upper right. The exact figure or symbol varies; common examples include the moon, a buddha, or a bodhisattva. The outer rim of the wheel is divided into twelve sections and given such names as the Twelve Interdependent Causes and Effects or the Twelve Links of Causality. Ignorance is the first of the 12 causes and conditions, both of our rebirth and of maturing any karma within our dependent existence. Different causes can overlap in different stages and even mature in next existences — lives. Yet the turning of the wheel goes onward. The twelve causal links are: (1) ignorance; (2) volitional action; (3) consciousness; (4) name and form (the fetus in a mother’s uterus); (5) six sensory organs (i.e. eye, ear, nose, tongue, body, and mind); (6) contact or touch; (7) sensation; (8) desire, craving; (9) possession; (10) creating more karma or becoming; (11) birth; (12) decay and death. The World of Devas is always at the very top of the wheel. The World of Asuras and the World of Humans are always in the top half of the wheel, bordering the World of Devas on opposite sides, but which of the two is on the left and which is on the right varies (leading to two different arrangements of the wheel). The World of Animals and the World of Hungry Ghosts is always in the bottom half of the wheel, with the World of Animals bordering the World of Humans and the World of Hungry Ghosts bordering the World of Asuras. Between the World of Animals and the World of Hungry Ghosts, at the very bottom of the wheel, is the World of Hell. Sometimes, the wheel is represented as only having five spokes because the World of the Devas and the World of the Asuras are combined into a single world. In Buddhist representations of the wheel, within each of the Six Realms, there is always at least one buddha or bodhisattva depicted, trying to help souls find their way to nirvana. The rim of the hub is divided into two sides. One side is the White Path or Path of Bliss, and represents how souls may move upward to the World of Gods. The other side is the Dark Path, which represents how souls may move downward to the World of Hell. In the hub, the center of the wheel, a pig, snake, and rooster turn in a circle, each biting the tail of the next animal. The pig represents greed, desire, or attachment. The snake represents hatred and envy. The rooster represents ignorance or delusion. These are the evils which are responsible for the trapping of souls within the Six Realms. The simpler form of the wheel of life has eight spokes and is primarily used only in Buddhism rather than in all the dharmic religions. The eight spokes represent the Noble Eightfold Path of Buddhism. They are said to have sharp edges to cut through ignorance. According to some Buddhist schools, the Buddha turned the one or more wheels of life into motion. For instance, the second wheel of Dharma was said to be the Abhidharma, whereas the third wheel of Dharma were the Mahayana Perfection of Wisdom Sutras, and the fourth wheel of Dharma were the Yogacarya or Cittamatrin sutras that taught the Tathagathagharba. The wheel of life is one of the eight auspicious symbols of Tibetan Buddhism. The dharma wheel can refer to the dissemination of the dharma teaching from country to country. In this sense the dharma wheel began rolling in India, then arrived in China, and then to Korea, etc. The Doctrine of Three Wheels is Buddha’s teaching that the dharma wheel must turn three times for a student to understand the dharma: once for hearing, again for understanding, and finally for internalizing. 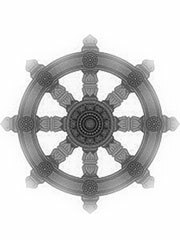 The first turning of the dharma wheel refers to Gautama Buddha‘s original teaching, in particular the Four Noble Truths which describes the mechanics of attachment, desire, suffering, and liberation via the Eightfold Path. The second turning refers to the teaching of the Perfection of Wisdom sutra, a foundational text of Mahayana Buddhism. The third turning refers to the teaching of the Mahavairocana Sutra, a foundational text of Tantric Buddhism. In Vigelandsparken in Oslo, Norway, there is also a sculpture with the name Wheel of Life (Livshjulet). Epstein, Mark (1995). Thoughts Without a Thinker: Psychotherapy from a Buddhist Perspective. BasicBooks. ISBN 0465039316.